Marines appear to be the fittest service members in today's force. Yet despite the Corps' culture of fitness and vigor, more than 4,800 Marines appear to be heavier than regulations allow. These previously undisclosed health statistics offer new insights into the military's growing problem with obesity and how it varies from service to service. The issue has broad implications for the health and readiness of today's force. The Pentagon's data is based on body mass index, or BMI. Individuals with a BMI greater than 25 are considered clinically obese. And within the U.S. armed forces, that rate has soared since personnel began deploying for months at a time to support the wars in Afghanistan and Iraq. As Military Times first reported in September, 7.8 percent of the entire military — roughly one in every 13 troops — has a BMI that is too high. This rate has crept upward since 2001, when it was just 1.6 percent, or one in 60, according to Defense Department data. Yet the problem's scope shifts significantly depending on the service. 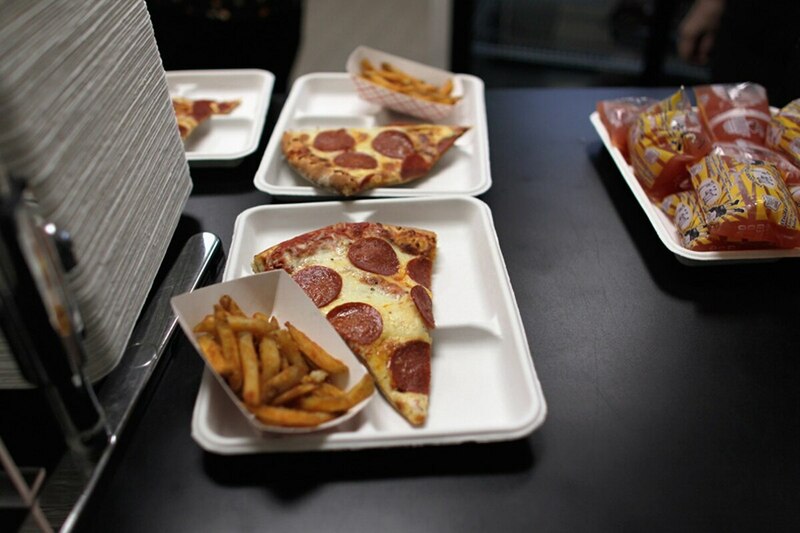 The Army, for instance, reports that 10.5 percent of soldiers are overweight, up from 6.4 percent five years ago. In the Air Force, 9 percent are overweight, more than double the 4.3 percent reported in 2011. Navy doctors diagnosed 5.9 percent of the fleet with elevated body-mass indices last year, up from 3.3 percent over the same five years. Among Marines, the rate was 2.3, up from 1.7 five years prior. The Pentagon has been reluctant to release this service-specific data. Military Times has been seeking it for weeks. Its disclosure comes as the military's top health officials are rewriting guidelines for body composition standards and the methods for evaluating it. For individual service members, a diagnosis of obesity can stall a career or lead to involuntary separation, so these policies are central to military life. However, military officials caution against placing too much emphasis on BMI scores, which simply evaluate an individual’s height and weight to flag those who might have unhealthy levels of body fat. The measurement is often criticized as a blunt tool that wrongly identifies bodybuilders with heavy muscle mass as being fat while missing flabby and unfit people with lanky body types. And many troops are critical of the military's current methods for determining whether they fall within standards. Soon that may change. Top military health officials plan to publish a new policy later this year, and it is likely to likely to scale back the Pentagon's reliance on BMI as a primary measurement of health and fitness, according to officials familiar with the review. 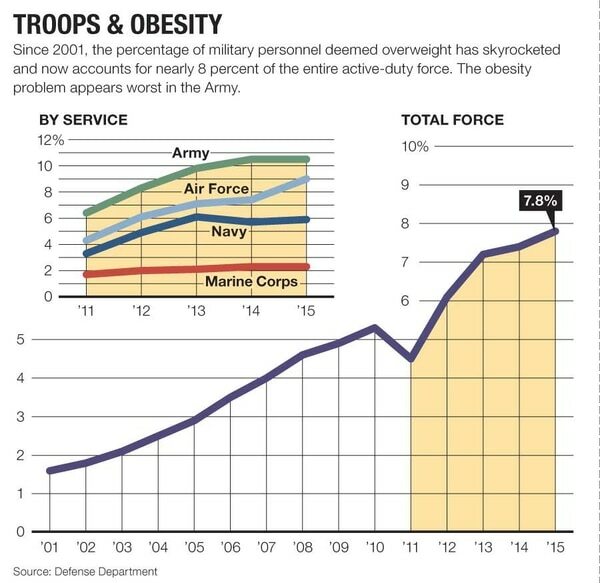 Compared to the U.S. civilian population, the rate of overweight troops is far smaller. About 70 percent of the adult American population has a BMI above 25, meaning they are clinically overweight or obese, according to data from the U.S. Centers for Disease Control. The obesity data provided by the Pentagon is derived from service members' health records. It reflects how often military doctors diagnose individual troops as overweight and record that concern in official files. The data is not drawn from the operational force’s unit-level testing for individual fitness assessments. The Army sought to downplay the data, saying that fitness is an important part of its culture. "The physical readiness of our soldiers is imperative to unit readiness and mission accomplishment," said spokesman Paul Prince. "The Army has strict physical fitness requirements and has multiple, coordinated initiatives in place designed to improve the readiness and health of the total Army. These efforts are geared to influence culture change that best facilitates personal health readiness and creates environments where the healthy choice is the easy choice." An Air Force spokesman said the Pentagon's obesity data fails to illustrate its personnel's improving success rate on the service's annual fitness test, which includes more comprehensive body composition assessments while evaluating personal strength and endurance. "Our Air Force is healthy and fit to fight, with approximately 96 percent of airmen passing the test in the past two years, which is up significantly from the 2010 pass rate of 87.6 percent," said spokesman Maj. Bryan Lewis. "The fitness assessment, however, is only one tool to assist in the determination of overall fitness of military personnel. Factors such as genetic history and risks, along with lifestyle choices such as diet, exercise, tobacco use, and stress levels contribute to the overall health of an individual." A Navy spokesman highlighted changes made to its annual fitness test last year. Those changes make it more difficult for sailors to fail the body composition assessment portion of the Navy's physical fitness assessment. But failure will come at a higher cost, as two failures within three years can result in a sailor being kicked out of the Navy, according to the service's new rules. "The Navy recognizes the importance of building a culture that emphasizes better health and better fitness," said spokesman Lt Joe Keiley. "That mindset helped shape the changes we made to our [fitness assessment] program in 2015 — changes that now help commanders better monitor sailor performance throughout the year, and provides increased focus on nutrition and diet counseling that gives sailors more control on staying within standards and mission ready." Marine Corps officials did not respond to questions about the new obesity data. In the past, the service has credited its remedial Body Composition Program with helping to keep rates comparatively low. With the smallest and collectively youngest demographic among the military services, the Marine Corps requires strict adherence to its fitness standards and over the years has seen personnel resort to unsafe weight-loss methods for fear that failing the look trim will jeopardize their careers. And while just 2.3 percent of the force meets the clinical definition of obesity, potentially thousands of other Marines are on the bubble, battling weight gain and the prospect of breaching standards. Some Pentagon health official say the data may be flawed, that there may, in fact, be no real increase in obesity. Dr. Terry Adirim, deputy assistant secretary of defense for health services policy and oversight, said the numbers may just reflect the fact military doctors are more aware of obesity and for that reason flagging it more often in official health records. "A physician who is now more aware about nutrition and fitness, they may be diagnosing it more than previous years," she said. "... You can’t tell from these numbers exactly what it is that is accounting for these apparent increases"
Adirim rejected concerns about military readiness and highlighted comparisons to the far higher obesity rates for the civilian population. "In fact," she said, "I feel good that our military service members are well below the general population." Tilghman is Military Times' Pentagon bureau chief.